ONLY FEMALE PUPS LEFT AVAILABLE. We are pleased to announce amazing litter of gorgeous? KC English bull terrier puppies. Available for their forever homes starting from 10th of April. FATHER: Bilboen Hell in the Stars (son of UK Champion? 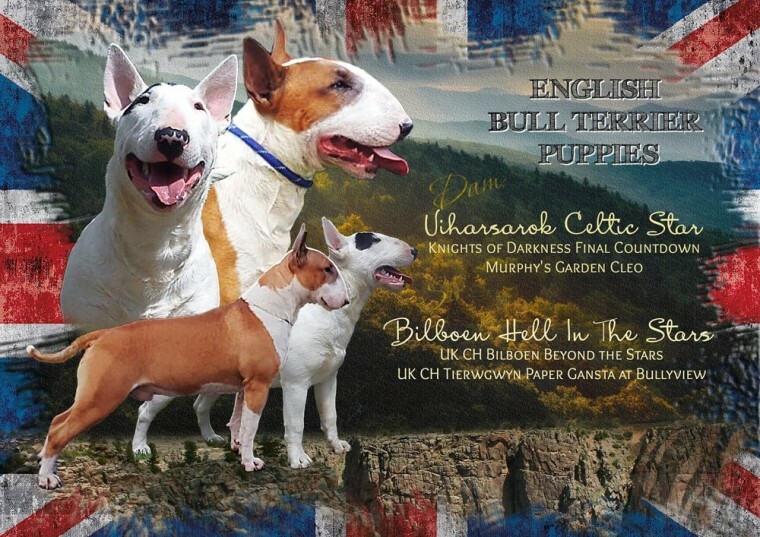 Bilboen Beyond the Stars and UK Champion Tierwgwyn Paper Gansta at Bullyview) MOTHER: Viharsarok Celtic star (granddaughter of European Champion Sonnysnow De Garnata Alvejud). Both parents fully health tested (heart, hearing, kidneys...) and very social, balanced dogs. Pups will leave with ? ?KC pedigree ? ?Health checked ??Microchipped ? ?Regularly worm and flea treated ? ?1st vaccination ? ?BAER tested ? ?5 weeks free insurance ? ?Early environmental exposure ? ?Reared with children ? ?Fed purely on balanced RAW diet Viewings welcome from middle of March. No time wasters please. Non refundable Deposit of 300 secures Puppy. Lifetime support regarding feeding, training and health? questions provided. Prices vary between 1600 and 1800, depending on the puppy. PLEASE CONTACT FOR MORE INFORMATION. Adopting, or buying a new puppy or dog is an important decision and big responsibility. As an owner, you will solely responsible for the welfare of your new pet and will also be financially committed. Before you decide to buy or adopt you must ensure that you’re 100% committed beforehand. For further information on caring for puppies and dogs, please visit our pet advice section. You can also find out more information about the English Bull Terrier breed by visiting the English Bull Terrier Dog Breed Information.